Bidding for this item has closed. 28" x 27 3/4" Appliqued and pieced fabrics (recycled and scrap prints, upholstery, sheers and metallic) with collaged paper Mibres-style animals. Wen I was 7, I bought The Complete Book of Doll Making & Collecting by Catherine Christopher. By 10, I was making toys and clothes. By 15, drapery, pillows and costumes, by 20, all my clothes and lots for others (wedding and bedding ensembles, slip covers, Roman shades. Over the years, other work (Admin/secretary/bookkeeper/Int. Designer/Fabricator/K-3 teacher/Gardener/Goat Herder/Farmer's Market Organizer) came and went, but sewing stayed. All because of that one book. 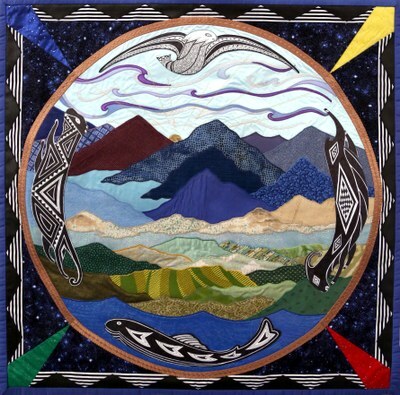 By 1999, in possession of a huge stash of scrap fabrics and inspired by the work of Tewa Women United in Pojoaque NM, I made the firs in an on-going series of Earth-themed "pictures." I call them stitchings (like a quilt, only thinner). Many dozens of these later, I plan to spend the res of my productive years making many more. I work independently and collaboratively. If you have an earth-themed project you'd like to discuss, feel free to contact me.And remember: we are all Earth Woman's children, please be good to our Mother.